This is a break from the typical lasagna and is 10 times easier to make. 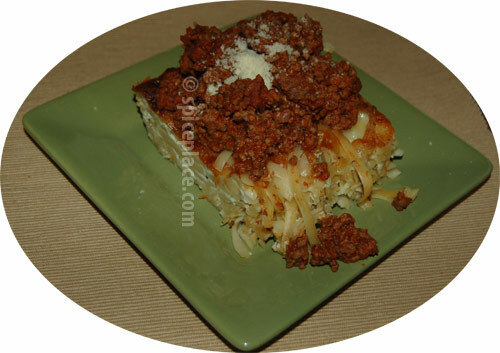 With the standard “right side up” lasagna it takes a good bit of effort to cook the lasagna noodles, the meat sauce and mix the cheeses, and then layer them all together before baking the meal. This recipe leaves out several of those steps and doesn’t use lasagna noodles at all. This Lasagna is made in two steps, first the noodles and cheese are baked, and then a meat sauce is made while the pasta & cheese are baking. 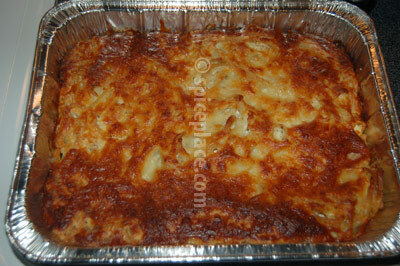 Finally the meat is place over top of the baked noodles and cheese forming the “upside down” lasagna. Cook the pasta according to package directions to al dente. Drain and rinse with cool water. Meanwhile, mix the cheeses together in a large bowl. Add the cooked pasta, and mix well using your hands. Bake in a 350° F oven for 30 to 40 minutes until top is browned. We use an aluminum disposable baking pan because after baking the cheese and pasta a regular baking pan is hard to clean. Cook the ground beef or turkey in a 3 quart sauce pan, mixing around and breaking up the ground meat into fine chunks. Add the chopped onion and cook for 1 to 2 more minutes. Then add tomato sauce, Spatini and water. Mix well. Lower heat to simmer and cook for 10 minutes, stirring occasionally. Cut a 4″ x 3″ piece of the cooked pasta/cheese and place on serving plate. Top with 1/2 cup of meat sauce. Sprinkle with fresh grated Parmesan Cheese. Serve with Garlic Bread.